It's very tiring being a responsible adult. Lots of work and cleaning and sensible decisions. To get me through all that boring stuff I choose something I really want to do, and use it as a treat to keep me motivated. Sometimes it works, sometimes it doesn't. 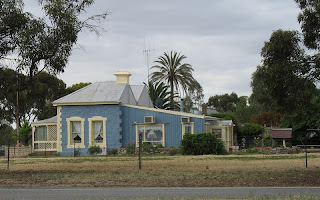 For weeks I've been using a trip to a neighbouring town as my reward; yesterday, having done three of the four things on my list, I sanpped and called Mereth. 'We're going to Jamestown' I declared. Jamestown is a pretty place about 45 minutes from here, a beautiful drive in this late spring weather. I had the coffee and snacks packed in minutes, picked up Mereth and we were off. Our destination is also home to a very nice patchwork shop, but that is entirely co-incidental. We used to come here with Mum, and drive around choosing which house we wanted to live in, and which garden we loved the most. Lots of happy memories there. Ahhh, Roses! 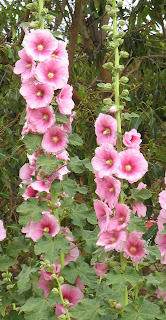 I love hollyhocks, but have never grown them. Mereth said they selfseed in my front garden here, so maybe I can finally have some of my own. At the patchwork shop I reminded Mereth to remind me that I wasn't in the market for more fabric, and I didn't want to buy anything. Didn't work a bit. 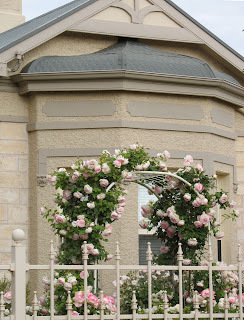 The nicest garden of the day was actually in another tiny town; the roses forming a hedge were breath-taking, and I love all that riot of flowers; perfect cottage garden. And this is a curious little house, only half a house really. Maybe they intended to build the other half later, and never did. I love the blue it's been painted, very pretty. Every morning when I walk into the workroom I brush into a dangling spider web. Just a thread or two, but enough to make me stop and reel it out of my hair and wonder, Is this like Charlotte's Webb, or Night Of The Arachnid? (link to picture of horrid Red Back Spider) Don't look if you don't like spiders! Yep, definite Night Of The Arachnid stuff. I certainly distorted this one! My DD was bitten by one as a child, and I can say with certainty, these things HURT. We spent 8 hours in the Emergency room, and it was awful. Her arm was painful for weeks. I don't want to share nicely with these critters. The show was a success, and we had a steady stream of visitors over all three days. Mind you, some of them may have been there for the wrong reasons; more than one person, on hearing me speak, immediately turned to a friend and said 'You're right, they even sound the same!' 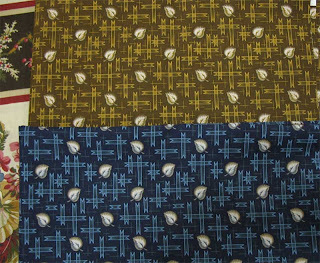 So the twin thing was a drawcard as well as the quilts. Apart from feeling like a freakshow it was funny to see the reactions. We talked to so many lovely quilters, and would-be quilters, and people who just admired quilts. We met a Canadian couple who had sailed a yacht over here in 1997, and had toured Australia in a motorhome ever since. 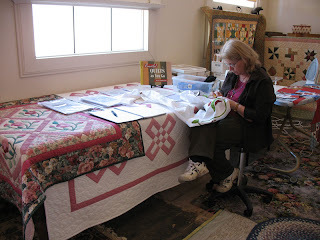 She was a quilter, and said it was time to go home and get back into her sewing room again. 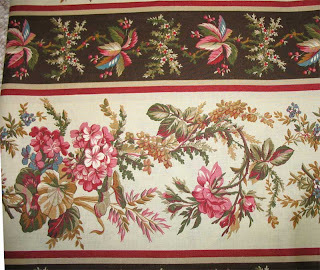 I can't imagine living a gypsy life for that long, without my sewingroom and stash and machines. But what wonderful memories that couple have, for those long cold Canadian nights! Our aunt and cousin came to visit too, and they thought I was Mereth! The real Mereth had sneaked off to have a cup of tea and a scone with friends, so it was an understandable mistake. Side by side we look quite different, but when we're apart people see who they are expecting to see. On Mereth's wedding day her FIL called me Mereth all day; um, she's the one in the WHITE dress, I had to keep telling him. After we closed the doors we went up to the Institute to help pull down the show. Everything vanished within half an hour, as teams of people stripped the quilts from the racks, others folded and piled and ferried them out to cars. Watching the people working like a huge family made me remember the shows I've seen taken down in America, with security guards and checklists and eagle-eyed supervisors making sure the quilts go to the right people. All very necessary, but we can afford to be a little more relaxed here. 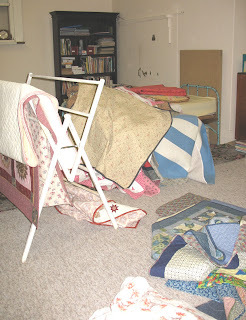 And then Mereth and I dumped all our quilts and racks and stands in one room and crawled off to the kitchen to drink coffee and groan about how tired we were. Luckily dinner had been in the crockpot all day, so we had a very early meal and a quick visit to the sewing room to rummage through the new fabric. But we didn't have the energy for anything else. Somehow I have enough pieces for 10 extra blocks! I kitted up the 31 blocks I needed, so I have no idea where these extras came from. Maybe I sleepwalk, and cut up fabric without remembering it. I do love making these blocks, so I will add the extras to the Orphan box, and see what I can do with them there. 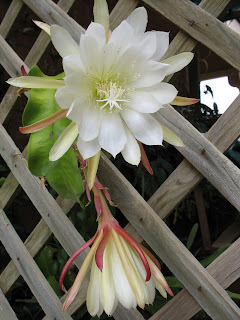 This last photo is one of Mum's cactus plants, with flowers bigger than my hand and stunningly beautiful. Unlike the red ones, these only last a day, but what a display! I suppose you've been thinking that my silence is due to long hours spent in the sewing room, playing with my fabric purchases. Not likely! 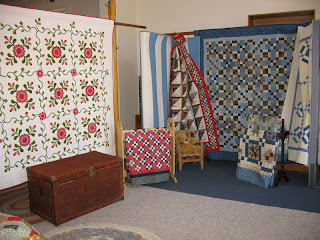 This weekend there is a quilt display in the Institute building, with work by the local group exhibited as a fundraiser for the primary school. We decided to do our bit to keep the visitors amused, so the bank building has been transformed into a mini quilt show. A steady stream of people this morning has commented on the fact that they are all our quilts. It is quite impressive, especially as I have 10 or so in the actual show as well, and Mereth has a similar number. I would have been sitting at my machine piecing, for demonstration purposes only, if my computer hadn't decided to do everything in ultra slow motion. As in taking 3 hours to start up! So I spent the day setting up my laptop as a replacement, connecting it to the net and installing an updated virus program and registering all the programs I use every day on the other computer. I am grateful that I know enough to get me out of trouble, but I don't know enough to fix anything. It being the weekend almost, I'm sure the computer guy won't get here till Monday now. I will make do. Mereth sat and sewed on some applique, so at least she achieved something today. I did get a few blocks made and sewn together last night, so that made me happy. Very early this morning I re-potted some plants that desperately needed it, and that made me feel good. This afternoon I baked muffins, which made me feel even better. Tonight I will sew some more, and have a muffin for supper, and then get caught up on all the work I didn't get done today. 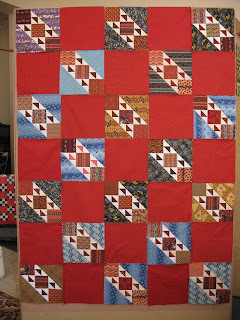 Tomorrow I will sew those demonstration blocks and hopefully get my quilt top in one piece, except for the borders. I am such an optimist. What a week so far! I need a day off already. We left Monday for another trip to the city, to line up suppliers and printers etc. We left after a quick visit to the patchwork club, to have morning tea and say hello. It was horribly hot and muggy, and we were delighted at the prospect of three hours in the air-conditioned car. First stop in the northern suburbs was a Spotlight, a chain of fabric stores, which was obligingly having a 20% off sale. It was Mereth's birthday, so we regarded it as a birthday present and a sign that we needed to buy fabric. Which we did. Do you think I'm a bit obsessed with stripes lately? Maybe.... 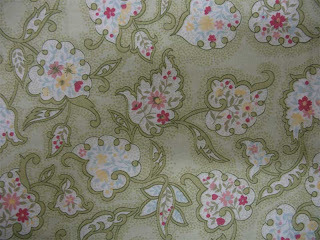 I got enough of this lovely pastel print for a backing. It's a lovely silky fabric, should look pretty. I also got some dutiful purchases like window blinds for the workroom, and pillows for beds, but quite a bit of material came away with me. I may be fixated on brown as well. 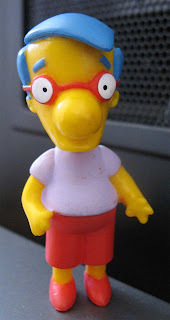 We then drove through the city in peak hour traffic, which was just horrible, and met Mereth's family for tea at Ikea. What's with the meatballs? And the Fish!!!! The cafeteria smelt like a beach at low tide, not at all pleasant. The 5 of us managed to polish off three plates of the meatballs between us, and 3 cups of coffee each; the coffee was great! It was my first time at Ikea, and I enjoyed it. There is so much to see, and so many ideas. 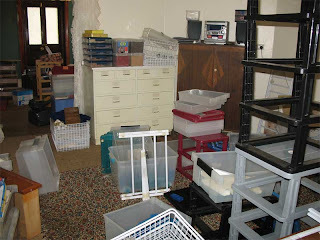 That plastic storage container is going by the Janome, to hold bobbins and cotton and machine feet. There were three in the pack, so Mereth scored one, and the other will find a home somewhere in the workroom. The Lazy Susan will have a tiny cutting mat on top so I can swivel pieces around as I cut them. I hardly need to explain coathangers and placemats; aren't they pretty tho? 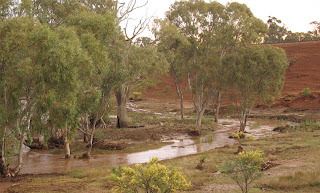 We stayed the night with first-born son and his partner, then set off the next morning on an arduous trek around the city. Gak, I couldn't live with traffic like that! 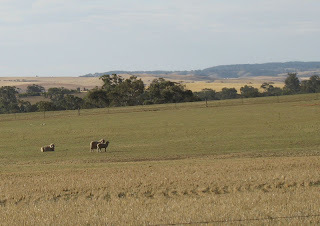 I got quite daring by the end of the day, zipping between lanes and scooting through amber lights with everyone else, but I much prefer driving in the country. I'm glad I'm not in the No-Buy group on Stashbuster. I am so glad to be home; I've almost caught up on messages and chores and now I'm going to have another cup of coffee and enjoy a jolly good gloat. The weather was vile yesterday, windy and hot and dry. Watering and mulching the garden became a priority, so we spent several hours tending to the plants and trying to get them prepared. Of course everyone else has had the same idea, so there is a scarcity of mulch hay here, but every time we travel to another town we find a few bales to bring back. We never did go in for normal souvenirs. And we were mad enough to buy some punnets of petunias for a bit of colour, so those had to go into the ground quick smart. Along with my usual lashings of parsley and spring onions. 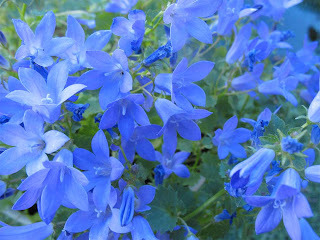 And I cannot resist blue flowers, so these campanula had to come home with me. The flowers are very dainty, only about 3/4" across, but there are masses of them and they are so cheerful. I think we are close to calling the garden finished, and then it will be just a matter of bucketing enough water onto it to keep it alive. 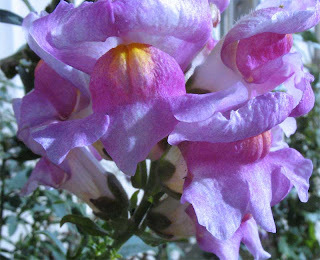 There are roses blooming bravely, and snapdragons too. The lemon and orange trees are covered in flowers, so hopefully there will be some fruit later in the season.It's nice to inherit these established plants, so that I don't have to start from scratch. 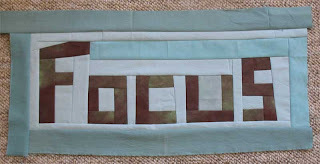 I made some more letters last night, and sewed them into this little banner, to go with the first one I made. I am gradually creating order here, and now I need to focus on the important things. Sewing, designing, making new contacts. Mereth was disappointed to learn that it will be another two weeks before the Statler arrives, but the delay does have advantages. 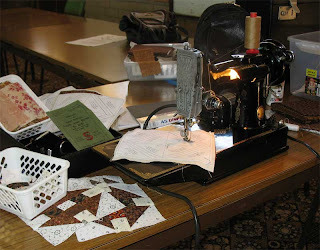 Once it's here we are going to be completely absorbed in quilting our stockpile of tops, so we should use this next fortnight to get our projects up to date and all other work sorted, so that we can devote ourselves to the new machine. Well that's my theory anyway. I spent a lot of time printing yesterday, and the waiting time between chores annoyed me as always. I set up a sewing area near the printer, and made more of these double anvil blocks, which were all kitted up and ready to sew. 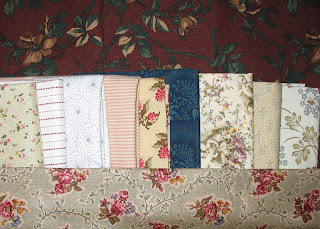 I'm nearly halfway to a quilt with these, and I love the eccentric stripes and bold blues. It's going to be a strong statement when it's finished. 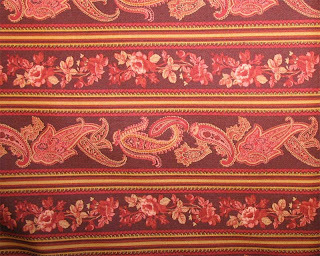 They look quite sedate against the neutral carpet, but they will be set with a red print, and that will liven them up. The gardening is very tiring, on top of all the shifting and organising work. My hands are full of prickles and rose thorns, so no hand-sewing for me. Yesterday I found the little doll quilt that I was hand quilting. 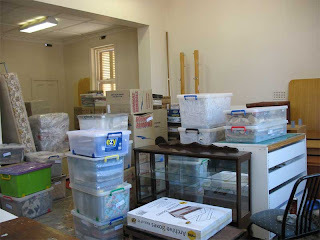 I'm at that stage of unpacking where I think 'Now what did I do with that (...whatever..)? I know I saw it somewhere, where did I put it?' Then I open a cupboard for something else and find three lost things that I shoved in there on day one and promptly forgot about. The fun is not yet over obviously. Still, I got to be 48 years old and never had a major move like this before, so I can count myself lucky. Last night, aching hands and sunburn aside, I had a nice time sewing these letters after dinner at Mereth's place. This has been my mantra for 25 years, and I like to think I'm making progress. I want to make it into a banner to hang in my sewing room. 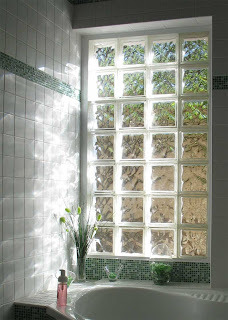 I love the way the afternoon light streams into the bathroom through those glass bricks. The plum tree outside makes glorious green patterns against the blue sky. I'm constantly struck by how beautiful the rooms in this house are; I feel like I'm living in a classy hotel! 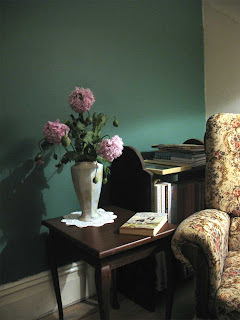 When we have finished setting up the house and office and workroom entirely I intend to sit in this very comfortable chair and read a book for hours, with many cups of coffee and not a twinge of guilt. Aren't those poppies fantastic? 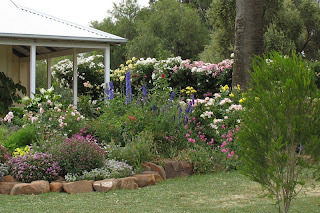 They self-seed in Mereth's garden like a weed, so there are always some to cut for flowers. The blooms are at least 4" across, and a mass of silky soft petals. The first meal I cooked in my new kitchen was spinach and cheese pie. On our road trip over we stopped for breakfast at a tiny petrol station that advertised home-made pies. The cheese and spinach one was divine, so we recreated here, without the pastry because it's healthier that way. It's simply 6 eggs, a cup of grated cheese, 1/2 cup of cream or milk and a packet of frozen spinach. I cooked it for 25 minutes in a med. 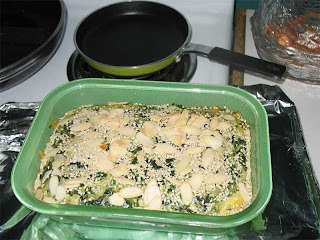 oven, then sprinkled on the sesame seeds and flaked almonds and let it finish cooking. It was divine, and there was enough for lunch the next day too. I have always wanted a cellar, and this place has a lovely little space with shelves and a window that lets in a surprising amount of light. It's inviting enough to put a chair down there and read. But I think it's going to fill up rapidly with things that need to be stored out of the way. 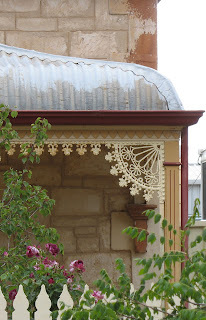 Very few modern Australian homes have cellars, and not many early homes had them either. Pity, they are a wonderful idea. When we finished the washing up last night I was so enchanted by the blend of colours and textures on the bench that I took a photo. 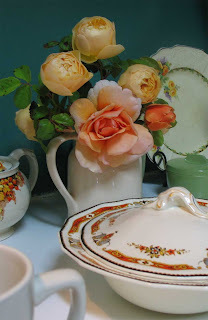 The roses are Charles Austin and Just Joey, and if I had thought to put some lavender in the vase it would have mimicked the pattern on the plate behind perfectly. 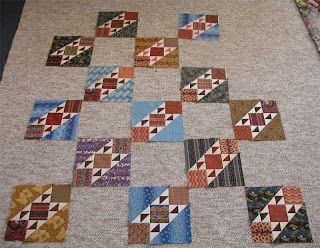 It seems we are so fixated on patchwork that we even want a patchwork carpet. 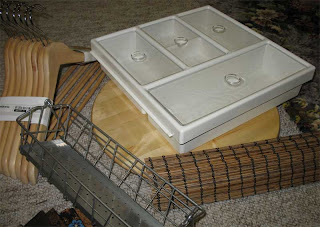 These are remnants that will cover the floor in the office/workroom. 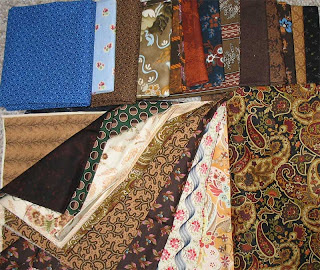 The carpet salesman thought we were mad to put so many different patterns together, but I think they look great. 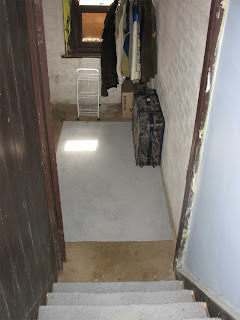 The space will be divided up into different areas anyway, office, posting, printing, quilting workroom; why not a different carpet for each area? We took a quick trip to Adelaide last week to fix up some business stuff. 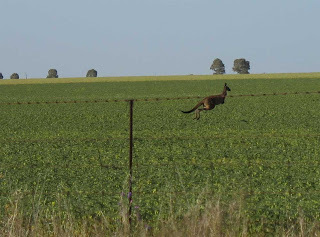 We left early in the morning, before breakfast, and spotted this fellow having a feed in a crop of legumes. He was keeping pace with the car for a while, then did a U-turn and bounded off in the opposite direction. On the weekend we went out to visit Mereth's boy Matt, at his place in the country. 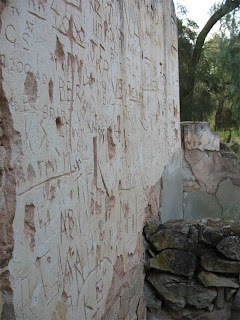 He took us through all the ruins that he helps caretake, and I was intrigued by this wall of graffiti, some of it over 30 years old. 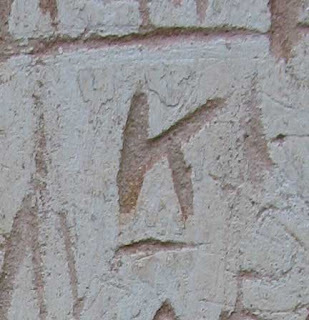 I really liked this 'K' and I may try to duplicate it in piecing. Once you start noticing letters you see them everywhere. 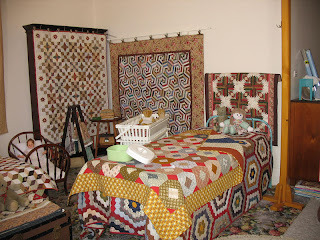 One of our first jobs will be to take decent photographs of my quilt collection. The bank building is ideal for this, with fantastic natural and/or artificial lighting, a large cream wall as background and enough room to set up a tripod and get the whole quilt in shot. In my old place I used to have to hang off the edge of the deck, risking life and limb, to try and get photos of large quilts. 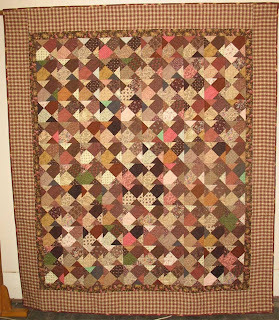 This is a 'T' quilt that I pieced and quilted many years ago. 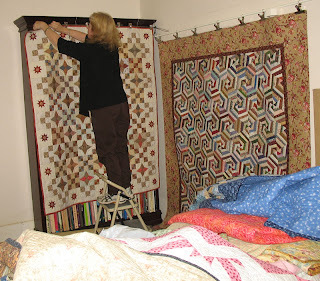 It's hanging on the stands to remind us that this is a quilting area. 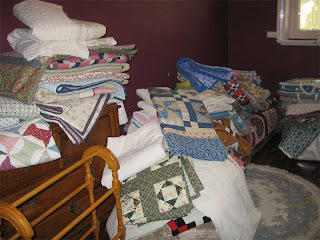 The smallest bedroom has become the dumping ground for my quilts. There's hardly room to get inside now, but we will sort it all out over the next few weeks. There is a bed and a chest of drawers under that lot, and about the same number of quilts on the other side of the room. HELP! 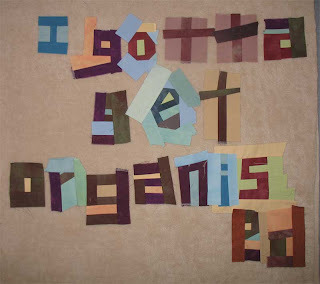 And the thing that I want to do above all else is put my sewing room to rights and get some sewing done. Blogger is being problematic, and I have been trying to complete this post for 3 days. It's so annoying to want to post, and not be able to! The only photo I was able to load is this pelargonium that has been blooming happily for more than a week. 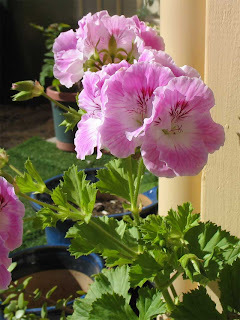 I could never grow these in humid Rockhampton, so I'm delighted that I can have as many as I want here. 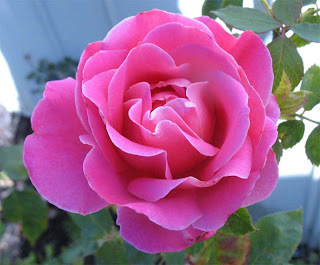 They are really easy care, and the flowers are stunning; I already have more than a dozen colours in my collection. Unpacking is progressing nicely, and seeing as the office is up and running I am going to spend the rest of the day in my sewing room. 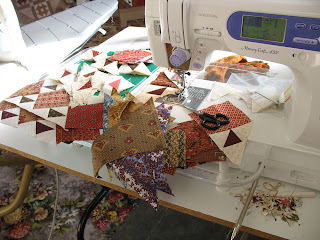 Yesterday we went to Patchwork Club, and I got to sew for the first time in weeks. I got to know my Featherweight a little better, and completed 50 half-square triangles before I left, so it was a good morning's work. We are waiting for carpet to be delivered tomorrow, and then the workroom will start taking shape. There is such a lot of planning left to do, trying to get everything in the best spot for it. I'm sure there will still be lots of furniture re-arranging going on in the next few weeks, as we come up with better ideas. It was all so peaceful early Tuesday morning, before the removal truck arrived with all my possessions. Then it was utter bedlam. Because this is a small town every car driving past slowed to a crawl to watch what was going on. I was stationed by the gate with the inventory, ticking off the items by number as they were unloaded. It all went smoothly except for the fact that one of the guys seemed to be dyslexic, which led to some moments of confusion when there were multiples of some numbers to be accounted for. But we sorted it all. Moving men do not understand quilting paraphernalia. My roll of wadding was described on the inventory as 'Package'. My quilt display stand caused much eye-rolling and head shaking. The plastic crates of fabric were incomprehensible. 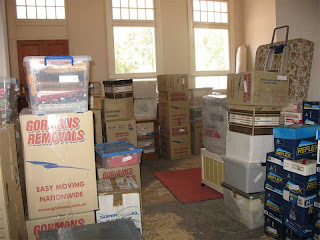 But the bulk of the astonishment was reserved for the boxes of books. They couldn't understand why anyone would own so many books. Good thing we're all different, I say. The last few days have been interesting and fun, unpacking and sorting and rearranging. This house is so beautiful that it makes my heart glad to just walk in the door, and I'm amazed at how well my belongings fit in. 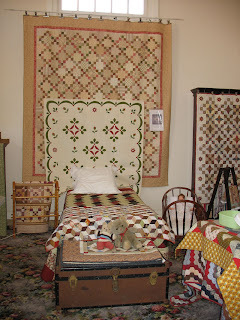 The main bedroom looks wonderful with my prints on the wall and my quilt on the bed. I marvel at how great it looks. 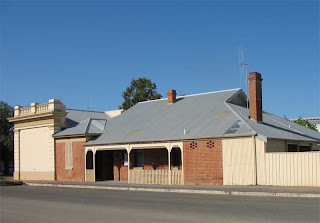 The two photos show the commercial part of the building, once a bank. The Statler will be set up in front of the two windows, and my office will occupy the back area. It's separated from the 4 bedroom residence, so I will be able to shut the door and walk away from work at the end of the day. If I want to, that is. I just may be having so much fun I don't want to stop.